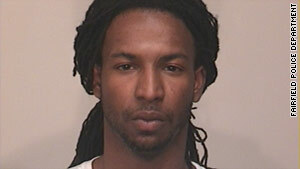 Albert Bailey, 27, and a juvenile have been charged with first degree robbery. (CNN) -- Authorities in Connecticut say two would-be robbers tried "phoning in" to pull off a bank heist. It didn't work. "I've heard of drive-up robberies where they rob the bank via drive-up windows," said Det. Lt. Michael Gagner of the Fairfield, Connecticut, Police Department. "But I've never had somebody call ahead and say, 'Get the money, we're coming.' "
The attempted bank job unfolded Tuesday afternoon at a branch of the People's Bank in Fairfield. Authorities said a bank employee received a phone call from a person demanding that $100,000 in large bills be gathered, or there would be a "blood bath" if the orders were not carried out. The employee hung up the phone and immediately called 911, Gagner said. The bank also initiated a lockdown but not before the caller's accomplice was already inside, Gagner said. According to Gagner, the accomplice handed a teller a note demanding money at the exact same time the bank employee was talking on the phone to the police. "The guy is literally giving us a blow-by-blow, saying the robbery is going down," Gagner said. After passing the note and collecting about $900, the suspect politely asked to be let out of the bank, Gagner said. By this time, patrol cars were on the scene. The suspect left the bank and encountered a police officer who ordered him to stop, Gagner said. The suspect then tried to run to the car where the other suspect was waiting. Both were arrested without incident. Police identified one suspect as Albert Bailey, 27, of Bridgeport, Connecticut. The other suspect is a juvenile. The two are charged with first degree robbery and threatening in the first degree. Gagner said Bailey is on probation for another bank hold-up several years ago. Gagner added that the robbers insisted that the money waiting for them not be put in a dye pack. Their wishes were not followed, and a bag of cash exploded in dye when one of the suspects threw it on the ground. "We were all kind of cracking up with the call ahead aspect of it," Gagner said, "definitely unusual technique."